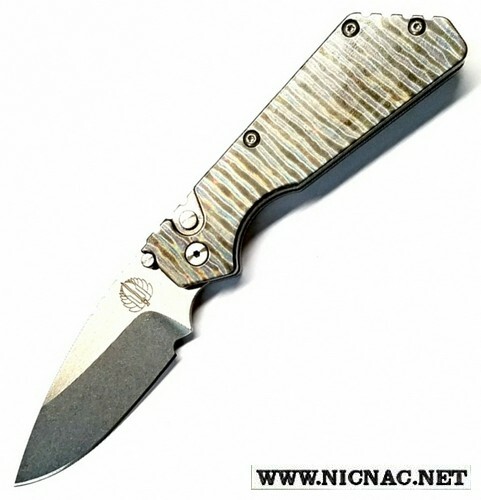 The Pro-Tech Custom Automatic Knife Pro-Strider 2317-SW prototype with a Tiger Stripe handle and a stonewash blade is overall open length 6.4 inches long with a 2.75 inch drop point flat grind blade with a Custom Shark Skin Pattern and has a milled 7075 aluminum handle with a black hard coat anodized finish. It opens with automatically with a front loaded firing button. The Protech Strider has a tip up titanium pocket clip and is made in the USA! This is the PERFECT pocket carry knife. You'll find this one in Joyce's Choices!